Our Fashion and Textile Design program stays small so you can do big things: 32 students with a portfolio review. A “study abroad-friendly” semester is built into your junior year. Pack your bags for countries like France, the Czech Republic, Australia, China and Italy. It feels like you’re actually working in the industry with your use of the latest technology! Your professors energize you and push you to new limits. The program melds aesthetic, functional, technical, and expressive appeal, combine cutting edge technologies with traditional design sensitivities, and use of the newest fibers and processes to create innovative textiles and the fashions and other products that use them. to NC State, you will be provided a link to the portfolio and essay portal. Using one piece from your portfolio, tell us what motivated and inspired you to design it. Include a description of your design process from creative inspiration to finished object. Step 1: Submit your online application to NC State by October 15. Step 2: Submit supporting application materials (official standardized test scores, high school transcripts, fee, etc.). Step 3: Upload portfolio of 10 recent images in .JPG format with descriptions and annotations into the portal. Step 4: Upload essay in Word format into the portal. Read more about image formatting and uploading instructions. Selected applicants will be invited to interviews that will take place on December 15th, 2018 in the Hunt Library on Centennial Campus. During the interviews, applicants will be asked to discuss their work as well as other character indicators such as: diversity, collaboration, leadership potential, independent thinking, ability to explain and critically evaluate work, and motivation to create objects that solve human needs. Fashion and Textile Design is a Bachelor of Science program that requires students to complete math and science courses in addition to design studios and labs. A strong math and science background is important for admission to and success in this program. For this reason, applicants are encouraged to take courses such as chemistry and college preparatory math while in high school. 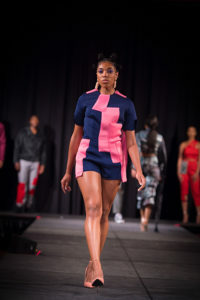 See our FTD Emerging Designers.